So here we are with the start of Stargate Atlantis, SG-1s younger, better-looking, and slightly copy cat spinoff. In a flash to the distant past we see some kind of ship fly over a snowy landscape before arriving at an advanced city buried in the ice. Soon after the city takes off from the environment, revealed to be Antarctica for destinations unknown. At the present day scientists from all over the globe continue their research at the Ancient Outpost, with research into how to activate the Ancient technology within which it appears requires a certain gene that only a few humans seem to still have. Drs Weir, McKay, and Jackson are looking through data relating to a Stargate address they’ve found which reveals that the address has eight coordinates, meaning Atlantis is located in another galaxy. Flying in to join the researchers is O’Neill, flown in by a young Major called John Sheppard. Unfortunately for the two of them one of the staff, Dr Carson Beckett, accidently launches an Ancient Drone while using the control chair which locks on to their helicopter. While the two Officers attempt to avoid getting blown out the sky Weir and McKay desperately try to get Carson to shut down the drone which they manage to do moments before it collides with O’Neill’s face. After arriving at the digsite O’Neill is slightly sceptical at the idea of not only a flying city but whether the expedition is even possible given the need to use the ZPM (the power device used by the Ancients) which would leave Earth defenceless. Elsewhere on the base Sheppard is getting a crashcourse on the entire mythology of a seven-season long TV show having been previously unaware of even the Stargate’s existence, finding out he has the gene (and the strongest form of it) when he sits down in the control chair. While Sheppard at first detests the idea of being involved with the SGC O’Neill convinces him otherwise. Despite his initial misgivings O’Neill decides to allow the Atlantis Expedition to go ahead after Weir convinces him of the benefit it could provide for both the SGC and Mankind in general, with Sheppard also being convinced to come along on the trip as part of the military contingent (unlike the SGC the AE will be mostly civilian run and operated and the military presence largely provided by the United States Marine Corps). Sheppard immediately has a falling out with Colonel Sumner, both due to their competing branches of the Service and Sumner’s issues with Sheppard’s brash personality. At the SGC the Expedition is prepped to go, with a MALP finding the endpoint is habitable, and the entire team head through the Gate to find themselves in a large reception hall/control room in what must be the City-Ship Atlantis. Just before the Gate closes O’Neill rolls through a single bottle of champagne, leaving the AE stranded in the Pegasus Galaxy with no immediate way home. The Expedition begin exploring their new home, finding it massive and complete with many items including small transport vessels, holograms, and highly advanced computer systems. The team find a recorded history of what happened to the Ancients, finding that the Gatebuilders, who had built a mighty empire in the Pegasus Galaxy, found a new enemy who slowly but surely wiped the Ancients out until the last survivors fled back to Earth which by that point had entered at least Late Antiquity while the city itself was lowered under the ocean to hide it. Much more pressing is that whatever power the city had is drastically falling due to the curious arrivals activating every system they find and that the shield stopping the water from crushing the city is failing first. The team immediately begin dialling addresses to find a planet that can function either as a fallback position or as a source of new ZPMs. A team led by Sumner and including Sheppard heads to an Earth-like planet that is currently at night. While it first appears clear the team stumble across a couple of children and then one of their parents, revealing that the Pegasus Galaxy is also filled with humans who speak English. While speaking with the kids on the way back to their settlement Sheppard finds out the monster the child was pretending to be is a Wraith. In the small village the team find shelter for the night and next morning learn more about their customs and this threat called the Wraith, seeing the ruins of what was clearly a once great city in ruins in the distance that these Wraith had apparently destroyed. While Sumner stays with most of the men in the camp he has Sheppard join one of the locals, Teyla Emmagan, who agrees to show him a ruin that depicts information about the Wraith. While in the ruins Sheppard hands her a necklace he finds on the floor before Teyla tells him the tale of the Wraith who they believe are a race who ever few hundred years wake and cull planets, killing most of the population and destroying civilisations, and then leaving enough survivors to maintain an adequate population to rebuild. That night a small group led by Lt. Ford who are guarding the Gate see it activate and three small alien vessels fly through the Gate to the village, where they begin using beams similar to those depicted in the drawings to beam people up. While the newcomers attempt to fight them off, successfully destroying one of the ships, many of them are easily captured by the ships. Ford however manages to successfully remember the symbols that are lit when the two remaining craft retreat through the Gate. On Atlantis McKay requests that Weir begin immediate evacuation as the shield is about to fail. Before they can do so however Sheppard arrives with both the Atlantis Security forces who remain as well as the surviving Athosians, the people of the planet they were on. Before they can redial out however Atlantis suddenly begins to rise from the bottom of the ocean, surfacing shortly later to the stunned reaction of everyone present. Despite the new environment fractures already begin emerging between Weir and Sheppard, who is now ranking military officer, regarding to the desire to rescue those captured by the Wraith with Sheppard wanting to leave immediately while Weir wants to get more intel first. In the city the team begin getting intel for an assault after the two leaders come to a compromise. Not only do they discover the abilities of the smaller vessels (which they nickname Puddle Jumpers) which include a cloak but also find that the Wraith have the ability to rapidly heal making them likely tough to kill. With the information in their possession and finding that the correct Gate is in space a small team including Sheppard and Ford are sent through in one of the ships to find and rescue those captured on the planet below. On the planet inside the Wraith facility the prisoners are confronted by the Wraith who take a prisoner for an unknown purpose. Sumner, wanting to protect the lives of the other prisoners volunteers next, confronted by a female Wraith who it’s apparent is the Queen. Sheppard and Ford infiltrate the facility with the help of a life-signs detector and find all the prisoners. Sheppard has Ford rescue and extract the prisoners while Sheppard tries to find Sumner, who is being interrogated by the Wraith Queen giving away the true scale of the human population on Earth before literally sucking the life out of him leaving him old and barely alive. Sheppard arrives too late, finding Sumner only a husk of his former self. Despite trying to kill the Wraith Queen he instead chooses to put his commander out of his misery but is then captured moments later. When he comes to the Queen attempts to interrogate him but he’s saved by Ford and together they kill the Queen but find that the Queen’s death has awoken the entire Wraith domain early. Escaping the ship the team make it back to the Puddle Jumper and flee the planet, only to find the Spacegate blockaded by enemy vessels. While attempting to lead the enemy fighters away they find that the Jumpers are armed with drone weapons much like those at the Ancient Outpost on Earth which they use to disable most of the vessels pursuing them before flying back through the Gate to Atlantis. In the aftermath both the AE and Athosians celebrate their new friendship and successful rescue mission while Weir and Sheppard discuss the makeup of the First Atlantis Reconnaissance Team, or FART for short. So here we are with Stargate finally becoming a proper TV franchise with its first spinoff set up and launched and already it has covered all the basics over the course of almost 90 minutes. We know who the new team are, featuring an old character we all love to hate, the new locations, and the new threat. Right from the get go the show makes significant strides to both setting the spinoff apart from SG-1 while also keeping enough to make it feel familiar. In terms of the former the show’s focus is vastly different as while the SGC had dabbled with the Ancients from time to time the Goa’uld always remained the main focus while here however the show smothers itself in the Ancients with not only the show being centred around an Ancient city but the main enemy being those who actually defeated the Ancients. It also reduces a lot of the fanfare from the previous show, such as the removal of announcing when you’re dialling the Gate, here they just do it. The civilian control aspect of the Expedition is also heavily played up, with it made clear very early that Weir is the highest command on the base. Finally we can already see that space combat is going to play a more prominent role than ever before, with the entire climax of the episode being a space battle above a planet. The similarities though between the two are still there. The show still features the military prominently in the setup, this time with the Marines making up the bulk of the base presence. Despite this however the main military character Sheppard is still Air Force, linking right back to the original show. Much of how missions are operated is almost the same, featuring the use of GDOs and a Gateshield to offer IFF capability and stopping invasion of the base every week. In terms of the plot the main thrust is to set up the main enemy of the series, the Wraith, and the arrival to Atlantis. 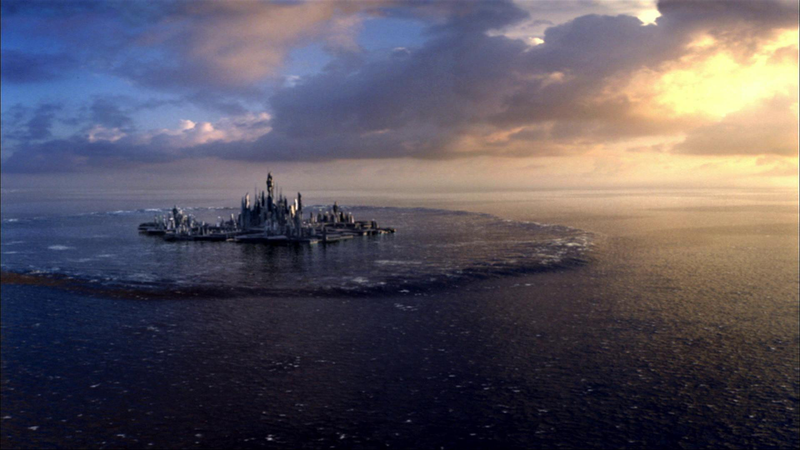 While it succeeds on both fronts, showing the Wraith to be a very different threat to the Goa’uld (who largely fight for slaves and territory compared to the Wraith’s obsession with harvesting people) and showing Atlantis to be the exact opposite of the cramped and drab SGC with its vast size and scale. At the cost of this however is the characterisation of pretty much everyone in the episode who even now we really know nothing about at all. The new lead Sheppard is literally just a wisecracking Major so far with no hints as to what makes him tick. The two exemptions to this are Weir and McKay who both featured on SG-1 and therefore have some personality but even that isn’t well-developed. Outside of this I think the main beat the show missed was in its military makeup. For such an international civilian contingent the fact that the US are solely providing the military personnel was a bit boring, meaning interesting issues such as inter-Forces cooperation and different training effecting missions wasn’t seen. This is made worse by the fact that SG-1 had already started to show more Russians on the show for a while but then that also got stopped, probably due to real-world politics. Overall however the opener is a great intro to the new show, introducing if not explaining the new character while also quickly setting up the core season arc of the season and the new enemies and locations to go along with it. · I see The North Face got their advertising yet again. · Once again everyone speaks English despite their ancestors never being on Earth for even old Germanic to have developed. Quote of the episode: “It’s a ship, it goes through the gate. I thought. Fine, Puddle Jumper, you are clear to go.” – McKay on finding out what the Puddle Jumper was named.